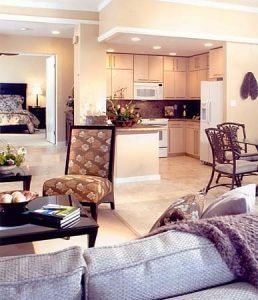 Lounge in Comfort & Style from the Privacy of your beautifully appointed Kauai Condo Rental. Decorated in an Island-Rattan Motif, Marvel at the Spectacular Oceanfront Views while Relaxing on your own Private Lanai, savoring another Gorgeous Sunset while sipping your favorite Tropical Drink. 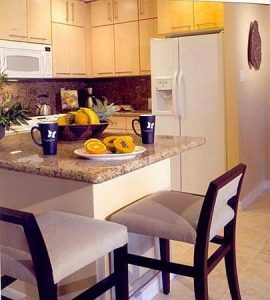 Appointments of your Hawaii Vacation Condo showcase Fully-equipped Kitchens with micros and blenders, Color-Cable TV, and VCR’S. For your Vacation Pleasure, Explore our Golden Sandy Beaches … Simply Ideal for Swimming, Snorkeling and Beachcombing! For your Added Enjoyment, Play a Couple Sets of Tennis, a Challenging Round of Golf at our Adjacent Course … Take a Refreshing Dip in the Pool …Then Prepare your ‘Fresh Catch’ on our Gas BBQ’S. Fantastic Shops & Restaurants are Nearby … and the Natural Beauty of the Island – Showcasing Cascading Waterfalls and the Famous Fern Grotto – are Just Moments Away! 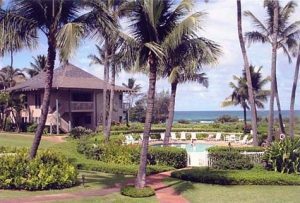 Welcome to the Ideal Beachfront Kauai Condo Vacation Getaway on the Magical Royal Coconut Coast … A Feast for the Eyes and Senses Just Steps to the Sand … at the Stunning ‘Lani Resort’. 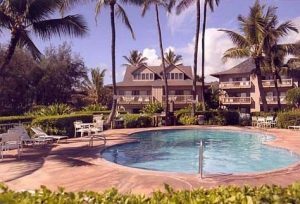 Your Beachfront Kauai Tropical Paradise Vacation Getaway – on the Magical “Garden Isle” – Features your Choice of Roomy 1-Bedroom Kauai Condo Rentals that accommodate up to 4 Guests; Spacious 2-Bedroom/2-Bath Kauai Vacation Condos that sleep up to 6 People; Or Expansive 3-Bedroom Kauai Condos that accommodate up to 8 Guests. All Linens & Towels Provided. Enjoy Inspiring Views Just Steps to the Sand . . .While Listening to the Sound of the Surf!